Cairo - The present capital of Egypt does not date back to ancient times like much of the rest of the region (nevertheless, of course, the site has been populated for millennia). By the early 10th century the Abbasid Caliphate was losing authority in its outer territories, much as the Umayyad Caliphate had done a century and a half earlier. But instead of being overthrown, as it had done to the Umayyad, the Abbasid broke in two. It was split along Shia-Sunni lines. In 909, the Shia Fatimid Caliphate was established in North Africa. It took its name from Mohammed's daughter, Fatimah, from which it claimed descent. This was the fourth great Islamic caliphate (Rashidun, Umayyad and Abbasid being the first three), and the only Shi'ite one. While it stood, it also was the only time in which two Islamic caliphates existed simultaneously (unless you count the successor state to the Umayyad in Spain). Its first caliph was Ưbaydallāh. The fourth caliph, al-Mu'izz, captured Egypt in 969, and founded a new capital, moving it from Mahdia in present-day Tunisia. 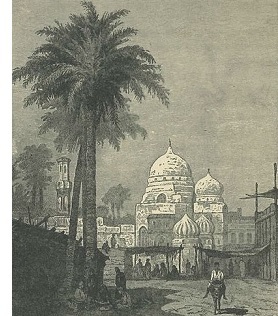 He named it al-Qāhira (Latinized as Cairo), which means "The Victorious". The city nearly fell to the Europeans during the Third Crusade, but the administrative center of Fustat was burned in 1168 by Vizier Shawar to make the city less palatable to the Crusaders. It was, however, taken over by the Muslim leader, Saladin, the following year. He abolished the Fatimid dynasty, established the Ayyubid dynasty, and re-aligned the region with the Abbasids.